I participated in a campaign on behalf of Mom Central Consulting for MetLife. I received a promotional item as a thank you for participating. At any given time, you could look around my home and likely find someone using an electronic device of some sort. Matt and I are fond of our laptops and the boys love the iPad, computer games, video games, TV, Blackberry Playbook.... You get the picture. It takes quality time away from us as a family though and is part of the reasoning behind us going on this extended trip this summer. 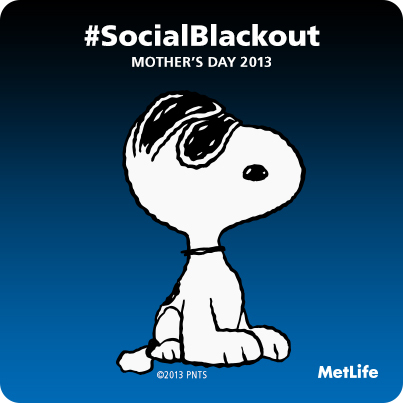 This Mother's Day, I plan on unplugging and joining the Metlife Social Blackout to spend quality time with my family! Where will you be for Mother's Day? What are your plans? I am in Destin right now at Brandcation, getting a little break from the boys before I am trapped in a tent with them for 53 days. However, I drive home on Mother's Day and once I get there, I will be unplugging and spending the day recouping and soaking up cuddles from the boys. If you all remember, I posted not too long ago about the importance of unplugging and taking the time to enjoy the things that really matter. The bottom line is, if something were to God forbid happen to my boys, I would not remember the posts I put up on my blog, but would instead remember the millions of memories I took the time to make with them. My own mom is getting older and I want to take every opportunity to spend as much time with my loved ones as I can before it is too late! Metlife has created an initiative to have a Social Blackout on May 12th, Mother's Day. They want people to unplug from the electronics, social media, etc. and just enjoy each other for a change. You can read more about it on their Facebook page. I think it is a great reminder to slow down and take a break in a world that often revolves around electronic screen time. Will you be joining the Social Blackout this Mother's Day? It will be just another day for us. My mom is out of town and the kids are too little to even know what Mother's Day is. I DEFINITELY plan on unplugging from it all -- I just want to focus on the kids and enjoying them. I'm planning on unplugging as I truly do need a HUGE break from it all, even if it's for one day! I could use a break from online. I"m sure gonna try to stay offline. Sometimes Ijust pick up my phone and go on FB or instagram simply out of habit. I am going to try to stay offline. This sounds like such a great idea! I think tomorrow after I wish my aunts a Happy Mother's Day all technology will be turned off. That seems like the perfect way to spend Mother's Day with my preschooler! I'm going to spend my entire day with my loving mom. After all, mother’s day is the day to tell your mother how much you love and care for her. I will definitely be going out with her, because we haven’t spent time together since last three months. I am so going to try and unplug. I have work to do in the morning, but taking off for the afternoon at least. We're having family over early and then breaking in our new Traeger! Having babies and becoming a mother I the world’s most beautiful thing which happens to a woman. I have six months old baby girl, and I really enjoy her company with me. It's quite enjoyable to spend some quality time with my baby. I’m still young and happy that I’m blessed with a baby girl of my own but I like this sweet connection. I took a break from social media today too! It was nice to spend time with the family! I spent most of today driving home from seeing my mom! I was off most of the day! I really cut down my social media usage yesterday and my husband didn't go online at all, which was such a sweet gesture!